 The classic pastrami sandwich: piled high on rye with bickles, cole slaw and Dr. Brown soda (photo courtesy P J Bernstein Deli | NYC). 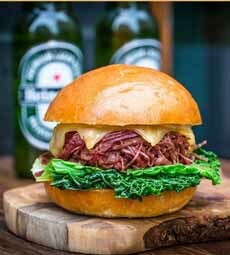 Pastrami on a roll with Swiss cheese, lettuce and tomato and red cabbage, watercress and mayonnaise (photo courtesy Dietz & Watson). With melted cheddar on a brioche roll (photo courtesy Gordon Ramsay Group). Thick-sliced on a baguette (photo courtesy Double R Ranch). 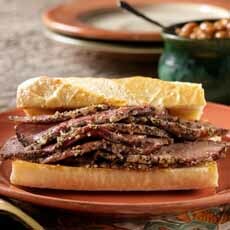 January 14th is National Hot Pastrami Sandwich Day. The classic Jewish deli pastrami sandwich came to New York City with Romanian-Jewish immigrants in the latter half of the 19th century. Pastrami is spicy cured brisket of beef. The brisket is salt-brined, seasoned with herbs and spices, and hot smoked. The typical pastrami spice-and-seasoning blend includes coriander seeds, dark brown sugar, granulated garlic, ground black pepper, ground cloves, kosher salt, smoked paprika and yellow mustard seeds. The spiced, smoked pastrami is then chilled and steamed (it is often kept warm on a steam table). In New York, it is thinly sliced (sometimes medium, but never thick) and served warm on caraway-seeded rye bread with a pot of brown deli mustard, accompanied by dill pickles and coleslaw. Deli mustard, by the way, is an American invention made from coarsely ground mustard seeds. It should have a hint of horseradish. The combination is the perfect accent to fatty pastrami and corned beef—and is delicious on ham, roast beef, turkey and everything else. In New York, the drink of choice is a can of Dr. Brown’s Black Cherry, Cel-Ray or Cream Soda, regular or diet (we wouldn’t turn down a good beer). That’s a New York pastrami experience. As pastrami traveled to different cities, it was “adapted”—to the horror of a New York deli purist—to include Italian rolls, soft rolls giardiniera, even (gasp!) marinara sauce and mayonnaise. The Kansas-style brisket with barbecue sauce was added to the list. You can get creative with a pastrami sandwich without violating any Geneva Food Convention. 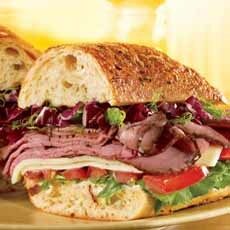 You can add or substitute without abusing the New York pastrami tradition. We mean, you can modernize it. We’re not talking wasabi mustard, pickled jalapeños or pesto, just some logical extensions, some borrowed from the Reuben (see below). Our favorite: pastrami on rye or pumpernickel with melted gruyere and caramelized onions. Plus the deli mustard and sides of pickles and coleslaw. Alas, our taste buds can’t go so far as pastrami on a baguette or any crunchy or flavored roll. Not even brioche. Although some day soon, we’ll try it in a pita picket. A Reuben sandwich is an enhanced corned beef sandwich, grilled or toasted on rye or pumpernickel with generous amounts of corned beef, sauerkraut, Swiss cheese and either Russian or Thousand Island dressing. When customers asked for it with pastrami instead of corned beef, it was christened (as it were) the Rachel sandwich (this was long before the Rachel haircut). There are other Reuben variations, for example substituting turkey and coleslaw for pastrami and sauerkraut. The Reuben sandwich dates to the late 1920s, but no one can solve the hotly-contested origin. Most evidence points to Reuben Kulakofsky, a Lithuanian-born grocer and resident of Omaha, Nebraska who created the now-classic sandwich for his poker pals who had a regular poker game at the Blackstone Hotel. The hotel owner liked it so much he put it on the menu. Native New Yorkers firmly believe that credit goes to Arnold Reuben, owner of a deli on 58th Street between Madison and Park Avenues, in 1928. 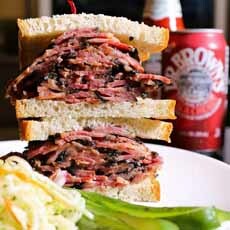 But either way, you can celebrate National Pastrami Sandwich day and think of them when as you enjoy a Rachel.